One of the first questions Sen. Mark Warner had for supporters of the planned Dahlgren Heritage Museum was one every organizer wants to hear. “What can I do to help?” he asked. On Monday, Warner met with board members of the Dahlgren Heritage Foundation, which wants to create a museum devoted to the history and technology of the Navy base, and its effect on the community. The senator asked specific questions about the museum’s mission, fundraising and status, then pledged his support. The group met at the University of Mary Washington’s Dahlgren campus. Those gathered included officials from the university, King George County and the Navy base, and foundation members. The senator, who owns a farm in King George on the Rappahannock River, said he felt guilty, as a part-time resident, for not visiting the Dahlgren center sooner and having a conversation about the museum. But he promptly agreed to include language in the senate version of a defense bill that directs the Navy to support heritage efforts such as the Dahlgren museum. Warner also offered to get defense contractors together and urge them to lend their financial support. Dave Deputy, a member of the museum board, asked if Warner would do the same with corporations and businesses. “Words from above don’t hurt,” Deputy said. Warner toured UMW’s Dahlgren campus – and later the base. King George Supervisor Ruby Brabo started requesting the senator’s visit soon after she was elected last fall. Fellow museum members were thrilled by Warner’s words of encouragement. “This really is a boost for all of us,” said Dr. Robert Gates, fundraising chairman of the Dahlgren museum. He joked that he couldn’t pass up the chance to give the senator a membership application. 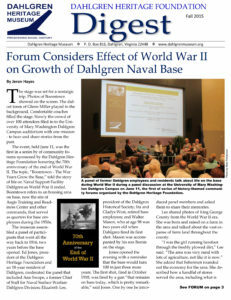 Two years ago, foundation started planning the Dahlgren museum, searching for Navy artifacts and a place to put them. In March, the group signed an agreement to move into the former Potomac Gateway Welcome Center on U.S. 301 in King George, Gates told Warner on Monday. “Did they give it to you for free?” Warner asked. “For $10 a year,” Gates answered. “That’s pretty good,” Warner said, smiling. Foundation members hope to paint and do other work on the building in the coming weeks. They’re gathering frames and display cases and hope to start putting up exhibits at the former welcome center and throughout UMW’s Dahlgren campus. Gates said the foundation has accomplished a lot in a short time. The group has raised $150,000 but would like to have about $1.5 million to get exhibits ready and cover operating expenses in the next five years. Local businesses are supportive, Gates said, and the group hopes Warner will help make connections outside the county.